The Shuttle Program Is Winding Down--What Next? Have you ever wanted to sail the -290 degree Fahrenheit seas of Titan? Yea, me neither. But thankfully NASA has come up with a method to sail the aforementioned seas, all while sitting at NASA HQ drinking a hot cup of cocoa. NASA recently announced that it has picked three science investigations for review, and it will soon pick one of them for a potential 2016 mission. One of the mission proposals is to study Mars's interior; another is to study a comet's nucleus in great detail. 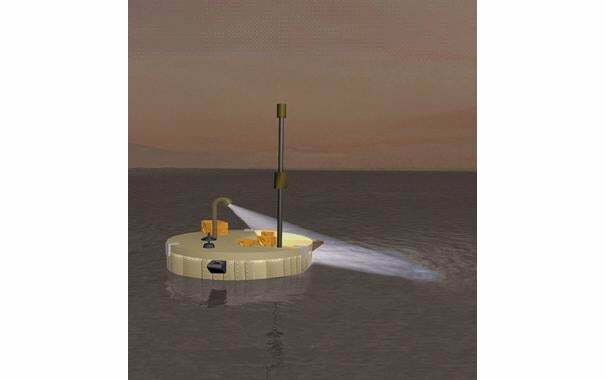 But the third mission stands out above all the rest: launch a spacecraft to Titan (Saturn's largest moon), land in and float on the surface of the frigidly cold liquid methane seas or lakes, and study the methane cycle of Titan. This mission to Titan is dubbed TiME, or Titan Mare Explorer. The "methane cycle" is believed to be similar to our own hydrologic cycle in which there is a continuous movement of water above and below the surface of the Earth (in Titan's case, it'd be a cycle of methane above and below its surface). In addition, the methane cycle also involves the exchange of energy and temperature changes that leads to evaporation, clouds, precipitation, and so on. If the researchers are right, Titan will have weather phenomena similar to Earth's, but instead of water it will involve the evaporation and precipitation of liquid methane. The project is headed by principal investigator Ellen Stofan and managed by the Johns Hopkins University Applied Physics Laboratory in Laurel, Md. Meanwhile, Lockheed Martin and Proxemy Research will develop the spacecraft. If everything goes right, TiME will launch in an Atlas rocket sometime in 2015 or 2016, and would reach Titan in the early 2020s. It will then land in Ligeia Mare, one of Titan's largest lakes, some 38,600 square miles in area. We'll be Christopher Columbus, except we'll all be sitting in the comfort of our home drinking hot beverages when the data starts coming in from Titan. Cool!